Cathal Brennan looks at RTE’s commmorations of the 1916 Easter Rising in 1966. The 50th anniversary commemoration for the 1916 Rising was a massive event for the Irish state and local commemorations took place in every county in Ireland. In previous years commemorations of the Rising had been mainly left to groups such as the National Graves Association and other republican organisations. This led to some hostility when the state got so heavily involved. The state commemorations focused heavily on the idea that this was an opportunity to present Ireland as a modern, successful state to the people of Ireland and internationally. For the first time since independence the Irish economy was steadily growing and wages and living standards were improving. The Taoiseach Seán Lemass presented the commemoration as an opportunity to, ‘further enhance the status of our nation in the eyes of the world, emphasising both our pride in the past and confidence in our future.’  For some, the idea that the Irish nation and the 26 county state were one and the same thing was deeply galling and the elephant in the room at all these events was partition. The golden jubilee would stretch the state broadcaster’s resources to its limits. According to Mary E. Daly for many Irish people, ‘the 1916 jubilee was commemorated not by parades or pageants, but on television.’ Telefís Éireann was just over four years old but the outside broadcast and film units had already acquired valuable experience in covering major events such as the state visit of President Kennedy to Ireland in 1963 and the Roger Casement funeral in 1965. To supplement TÉ’s own OB unit two additional OB units were hired from an international TV company. . Since the beginning of TÉ, producers such as James Plunkett, Charles Scott and Aindrias Ó Gallchóbhair had been conducting interviews with survivors of the 1912 – 22 period and these interviews became invaluable sources while making programmes for the commemoration. More than seventy veterans gave interviews to TÉ either in their homes or in studio. RTÉ’s commemoration of the golden jubilee year began with a series of 19 Thomas Davis lectures entitled Leaders and Men of the 1916 Rising on Radio Éireann. The series began on Sunday, the 10th of January 1966 and sought to not, ‘merely mark the 50th anniversary of an event but to analyse and reconstruct the minds of the men who, in very different ways, were factors in the making of that event.’ The series ran until May and featured some of the most respected historians of the time with F.X. Martin serving as consulting editor. 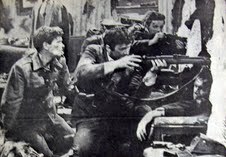 1965 saw Teleifís Éireann attempt their first history series entitled The Irish Battles. 1966 began with a new television series called The Course of Irish History edited by F.X. Martin and T.W. Moody. The series dealt with Irish history from pre – historic times up to the present and finished with a debate between the contributors involved. Historian T.W. Moody hoped, ‘the programmes should be as balanced as possible’ and they featured many historians who had taken a critical view of the Rising. Moody was also a member of the Radio Éireann Authority and the previous year he had expressed his concern that ‘all aspects of the Rising should be taken into account, and it was agreed [by the Authority] that in presenting the clash of idealism and emotions, the programmes should be as balanced as possible.’ The series consisted of 21 episodes and was conceived as, ‘a comprehensive, popular introduction to a large and complex subject which will exploit the resources of television in support of the spoken narrative.’  The series was later published in book form. The range of subjects covered by the these programmes was impressive. The Thomas Davis Lectures included episodes dedicated to the likes of Birrell and Nathan, Redmond and the Parliamentarians, Craig and Carson and the Labour movement. Both series featured many respected historians who had taken a critical, and non – celebratory, view of the Easter Rising. Another new series to mark the 50th anniversary of the Rising was a collection of 12 historical plays, presented by Michaél Ó hAodha, to reflect the cultural influences that were at work before and after the 1916 period including When the Dawn is Come by Thomas MacDonagh and The Singer by Patrick Pearse. Brian Boydell also composed a cantata called A Terrible Beauty is Born. It was performed by the Radio Éireann Symphony Orchestra in the Gaiety Theatre and broadcast on RÉ on Easter Monday. Boydell described the invitation as, ‘a tremendous sign of the coming maturity in the country,’ as he was both an Anglo- Irish Protestant and president of the Irish Pacifist Movement. On the 17th March, Prionsias Ó Couluain presented a feature on the Irish Volunteers and their St. Patrick’s Day parade in Tullamore in 1916. According to Ó Couluain, ‘The St. Patrick’s Day activities of the Volunteers were an important part of the preparation for the Rising at Easter,’ and, ‘a couple of days later they were to take even more aggressive action – in Tullamore in defence of their arms – and it was on this occasion that the first shots of the Rising might have been said to have been shot.’  The Radio Éireann documentary featured interviews with Séamus M. Ó Braonáin (one of the Tullamore volunteers involved in the affray in which an RIC sergeant was injured), Dennis MacCullough, Ernest Blythe and Leon Ó Broin. Two documentary series drawing heavily on interviews with survivors of Easter Week were On Behalf of the Provisional Government on TÉ and The Week of the Rising on RÉ. On Behalf of the Provisional Government was a profile of each of the seven signatories of the Proclamation containing recollections of family members and comrades who had fought alongside them. The series was scripted by Owen Dudley Edwards and the narration was provided by Niall Tóibín. The Week of the Rising presented a day to day account of what happened during the Rising with interviews conducted with participants from the RÉ archives together with interviews specially done for the occasion. The series was presented by Proinsias Mac Aonghusa. 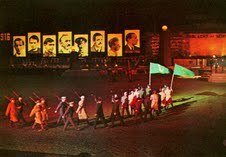 Teleifís Éireann broadcast two pageants which were specifically written for the golden jubilee commemorations, Seachtar Fear, Seacht Lá (Seven Men, Seven Days) by Bryan McMahon and Tomás MacAnna’s Aiséirí (Resurection). Pageants were a medieval dramatic form that had been particularly popular in Europe at the begining of the 20th century. The staging of pageants had been used by Patrick Pearse as one of the main cultural activites in his school, St. Enda’s, and revolved around figures from Ireland’s history and mythology, such as Cúchulainn. Seachtar Fear, Seacht La was commissioned by the GAA and staged in Croke Park on St. Patrick’s Day and again on the following two days. It was also performed in Casement Park in Belfast during Easter week. This was the third pageant McMahon had written for the GAA and he thought it ‘should be written, like the ballad, in broad simple, yet bold strokes.’ The cast of almost four hundred included the Artane Boys Band, two other pipe bands, 150 boys from the Dublin County Board and 150 girls from the Dublin Camogie Board. Bryan MacMahon also wrote a series of four plays aimed at children about the Rising which were broadcast during Easter week. Aiséirí depicted the struggle for Irish Independence from 1798 to the establishment of the first Dáil in 1919. Among the cast were Micheál Mac Liammóir as the ‘Voice of History’, Ray McAnally as Padraig Pearse and Cecil Sheridan as Jim Larkin. The RTV Guide for the week was a special commemorative edition. That edition sold over 250,000 copies compared to the normal circulation of 93,000. It was, at forty eight pages, double the size of a normal edition, was full colour and contained many publicity stills from its centrepiece drama, Insurrection. The RTV Guide described it as ‘undoubtedly the most difficult and ambitious project ever attempted by Irish television.’ It was a dramatic reconstruction of the events of Easter Week as it might have been seen by an Irish television service at the time. ‘Insurrection’ was a dramatic, news-style reconstruction of the Rising. Ray McAnally acted as the studio anchor of a news programme that presented daily coverage of the Rising as it unfolded, with TÉ reporters broadcasting on the spot updates of the events and conducting interviews with key participants. McAnally interviewed guests in studio and also used models and street maps to explain to viewers what was happening. According to Louis Lentin, ‘the style was going to be one of actual reportage: we decided to take you the viewer back to 1916 and present the specific day’s programme as an involved news reportage of the events of that day.’ It was a half hour programme that was broadcast over eight consecutive nights beginning on Easter Sunday. Insurrection borrowed this format from the BBC drama Culloden, which was broadcast in 1964 and directed by Peter Watkins. Hugh Leonard was approached to write the script, with Dr. Kevin B. Nowlan of UCD employed as the historical advisor. Leonard described the assignment as ‘ an invitation no writer in his senses could turn down; an opportunity to write a definitive television history of the most improbable insurrection of this or any other century.’ Leonard’s script was heavily influenced by Max Caulfield’s The Easter Rebellion, which had been published in 1964. The series was produced and directed by Louis Lentin, with the film unit scenes directed by Michael Garvey. Over a period of three months three different film units were in operation. The Defence Forces provided three hundred members for the battle scenes and a further two hundred extras were required for the series. The production also placed a huge demand on the Art and Costume Departments. The designer Alpho O’Reilly, when interviewed for the RTÉ archives in 1989, described locating the original GPO clock from a Board of Works store along with finding clothes, weapons and vehicles that would be appropriate to the period. Householders had to be persuaded to remove TV aerials and garden ornaments, and modern bus stops and street markings had to be removed or concealed during shoots. Essential locations such as Clanwilliam House were recreated as studio sets while the interior of the GPO was the largest set ever built by Telefís Éireann. The most telling scene for the modern viewer watching the series now is the final scene of the final episode, broadcast on the 17th April 1966. Ray McAnally is outside Kilmainham Gaol. An ambulance, bringing James Connolly, arrives at the prison. After quoting Pearse, ‘…If our deed has not been sufficient to win freedom, then our children will win it by a better deed.’ A volley of shots ring out and McAnally closes the report by saying, ‘The insurrection is over, or is it?’ In the drama McAnally is referring to the War of Independence which is still to come, but for the viewer now it is hard not to watch the clips except through the prism of the Troubles, which broke out just three years later. The central player in the week’s commemorations was Éamon de Valera. In his dual role as President, and the only surviving commandant of the Rising, he was to the fore in all the events of the week. 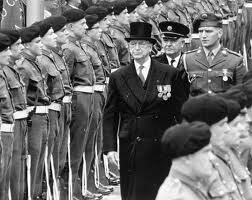 With a presidential election due shortly after Easter his political opponents worried that the golden jubilee celebrations would, inadvertently or otherwise, become part of the campaign to re-elect President de Valera. In the end de Valera defeated his Fine Gael opponent, T.F. O’Higgins, by 10,000 votes and his prominence during the commemoration certainly didn’t hurt his re-election. The prominence of James Connolly during the week’s commemorations led to a renewed interest in Connolly’s writings and beliefs. 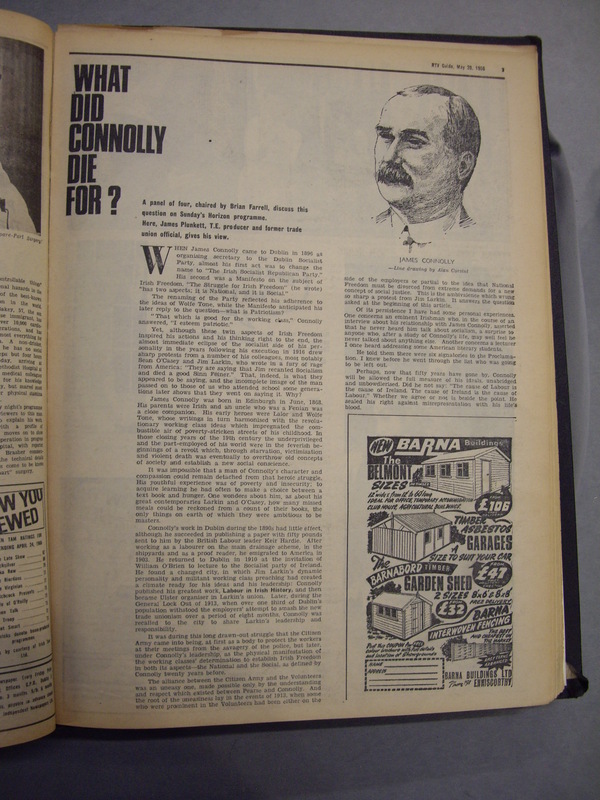 TÉ’s Horizon programme had a special edition where Brian Farrell chaired a debate entitled ‘What did Connolly die for?’ TÉ producer James Plunket, in an article about the programme, described the misrepresentations of Connolly’s beliefs after his death and wrote that in an interview with an ‘eminent Irishman’ about his relationship with Connolly the interviewee claimed that he had never heard him talk of socialism! The republican movement had been turning sharply to the left in this period. 20,000 people took part in the Easter Sunday parade down the Falls Road in Belfast. Representatives from the Belfast Trades Council and the Communist party took part and the main oration was delivered by Seamus Costello on behalf of Sinn Féin. In his speech he blamed capitalism for dividing the working class in the North. The prominent role of Connolly during the commemorations led many to take an interest in his writings. Lectures and publications on the role of Connolly’s socialism and the Irish Citizen Army appeared and within three years the Labour Party was contesting a general election on the basis that ‘The Seventies will be Socialist’ and ruling out coalition with wither Fianna Fáil or Fine Gael. The men of 1916 as portrayed in 1966 -"to be admired but not emulated". The coverage of the golden jubilee commemorations was a triumph for RTÉ. Despite the technical and financial limitations they were working under they managed to cover all the major events of the week and news reports also broadcast some of the local commemorations throughout the country. 1966 saw huge resources devoted to Irish history on both radio and television and an invaluable archive of material was built up containing interviews with many of the participants in the rebellion. The station was also able to integrate the Easter Rising throughout the schedules in their music, youth and drama programmes. Overall RTÉ broadcast over 53 hours of material devoted to the Rising during Easter Week. The popular consciousness of the week was heavily influenced by the broadcasts and people throughout the country could watch and listen to the main events as they took place in Dublin. Television took on a communal function as the novelty of the medium meant many people went to the homes of friends or families or public halls to watch the coverage. The eruption of the Troubles in 1969 saw many in the south question their attitudes to Irish nationalism and the 1916 Rising. State commemorations of the Rising were quietly dropped in the early seventies and only reinstituted in 2006. Conor Cruise O’Brien, in his 1972 book States of Ireland, argued that the commemorations of 1966 inspired militant republicans and that the methods of 1916, ‘violence, applied by a determined minority,’ could, in their minds, bring about unity. Many of the rebel songs relating to the period were dropped from RÉ’s playlist and republican folk bands, such as The Wolfe Tones, were no longer asked to perform on RTÉ. After repeating Insurrection once, in May 1966, the station never rebroadcast the series. The calibre of the history programmes ,and the quality of their contributors, put out during 1966 is a sad contrast to the lack of programming on Irish history in subsequent years. During the Troubles attitudes towards censorship, and coverage of the events in the North, were to become a constant source of controversy within the national broadcaster. RTÉ played a crucial role in people’s perceptions of the comemorations and with the advent of hostilities in the North a repeat of the state and the media joining together to publicly celebrate the revolutionary foundations of the state would not be possible. Daly, Mary E., O’Callaghan, Margaret (Ed.s), 1916 in 1966 – Commemorating the Easter Rising (Dublin, 2007). Hanley, Brian, Millar, Scott, The Lost Revolution (Dublin, 2008). Higgins, Roisín, Holohan, Carole, O’Donnell, Catherine, 1966 and All That: The 50th Anniversary Commemorations (Dublin, 2006), History Ireland, Vol. 14, No. 2. Lynch, Brian, Through the Eyes of 1916 (Dublin, 2006), History Ireland, Vol. 14, No.2. Martin, F.X., 1916 – Myth, Fact and Mystery (Dublin, 1967), Studia Hibernia, No. 7. History Ireland, Vol. 18, No. 6,. RTV Guide (Dublin, 1965), 31 December 1965. RTV Guide (Dublin, 1966), 21 January 1966. RTV Guide (Dublin, 1966), 28 January 1966. RTV Guide (Dublin, 1966), 11 March 1966. RTV Guide (Dublin, 1966), 8 April 1966. RTV Guide (Dublin, 1966), 29 April 1966. RTV Guide (Dublin, 1966), 20 May 1966. Irish Independent, 12 February 1966. Daly, Mary, O’Callaghan, Margaret (Ed.s), 1916 in 1966 – Commemorating the Easter Rising (Dublin, 2007), p. 21. Lynch, Brian Through the Eyes of 1916 (Dublin, 2006), History Ireland, Vol. 14, No. 2, p.54. RTV Guide (Dublin, 1966), 8 April 1966, p. 5. Daly, Mary, O’Callaghan, Margaret (Ed.s), 1916 in 1966 – Commemorating the Easter Rising (Dublin, 2007), p. 161. RTÉ Archives, ‘Authority Minutes,’ 30 July 1965. Ibid, 21 Jan 1966, p. 2. Ibid, 28 Jan 1966, p. 13. RTV Guide (Dublin, 1966), 8 April 1966, p. 25. RTV Guide (Dublin, 1966), 11 Mar 1966, p. 7. Daly, Mary, O’Callaghan, Margaret (Ed.s), 1916 in 1966 – Commemorating the Easter Rising (Dublin, 2007), p. 151. Augusteijn, Joost, Patrick Pearse: proto – fascist or mainstream European thinker? (Dublin, 2010), History Ireland, Vol. 18, No. 6, p. 35. RTV Guide (Dublin, 1966), 1 April 1966, p.3. GAA Ard Comhairle, 4 February 1966. RTV Guide (Dublin, 1966), 1 April 1966, p.15. RTV Guide (Dublin, 1966), 8 April 1966, p. 6. Daly, Mary, O’Callaghan, Margaret (Ed.s), 1916 in 1966 – Commemorating the Easter Rising (Dublin, 2007), p. 157. RTV Guide (Dublin, 1966), 8 April 1966, p.6. RTV Guide (Dublin, 1966), 29 April 1966, p.5. RTÉ Annual Report, 1967, 7. Lynch, Brian Through the Eyes of 1916 (Dublin, 2006), History Ireland, Vol. 14, No. 2, p.56. NAI DEA, 2000/14/106, RTÉ to External Affairs, 12 May 1966. RTV Guide (Dublin, 1966) 29 April 1966, p. 2. Daly, Mary, O’Callaghan, Margaret (Ed.s), 1916 in 1966 – Commemorating the Easter Rising (Dublin, 2007), p. 163. Derry Journal, 29 March 1966. (Dublin, 2006), History Ireland, Vol. 14, No. 2, p. 32. RTV Guide (Dublin, 1966) 20 May 1966, p. 9. Hanley, Brian, Millar, Scott, The Lost Revolution (Dublin, 2008), p. 55. Written by: Cathal Brennan on 18 November, 2010.on 10 April, 2012. 12 Responses to "A TV Pageant – The Golden Jubilee Commemorations of the 1916 Rising"
As always Cathal very comprehensive, and interesting to read in light of the recent events currently at play in the country. I wonder will we (proabably not us, but historians of the time I’m assuming) be writing about these current events as you have about the last fifty years gone with affection? Your article talks about the new form of documenting events, i.e. the advent of television reporting, It’s funny when you talk about RTE streching their technological capabilities in trying to report from the frontline but when I look at their coverage of recent weeks I’m really wondering have they progressed at all since those black and white days; in which I’m referring not only to broadcast quality output, but also news reporting in general. Thanks for the comment Seamus. I’ve managed to find two of the radio documentaries mentioned in the article on the RTÉ website under the Documentary on One podcast section. A documentary by Prionnsias O Conluain about what didn’t happen in Ulster in 1916 – whilst the rest of Ireland was uprising against home rule, Ulster remained subdued. A documentary told by those who took part in the 1916 Rising. It is made from archive recordings made by Proinsias Mac Aonghusa in the 1960’s, broadcast during the 50th anniversary commemoration as The Week of the Rising. It says alot about this so called “republic” today that no Irish television station televised the states Commemoration ceremonies for the 95th anniversary of the Easter Rising, but two are televising the British Royal wedding.